Imagine this scenario: You’ve worked hard on building a brand – either yours or your client’s – grown it over years and years, increased brand awareness, and done so with flourishing sales, too. And now imagine after all that hard work, you stumble across one of your ads next to some questionable content, or in an environment that promoted the complete antithesis of what you’d spent years building up. That ad would stick long in your (and your customer’s) memory, but for all the wrong reasons. In today’s uncertain digital environment, one small misstep can potentially cause immeasurable, and in some cases even irreversible, damage to a brand’s reputation. For this reason, brand safety is now more important than ever. If you’re wondering what steps can be taken to safeguard your advertising efforts, Exponential can help. 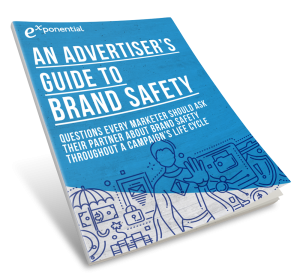 We created “An Advertiser’s Guide to Brand Safety” to highlight the important details advertisers should know, and the questions they should be asking all partners on their media plan, to ensure brand safety. Download the full guide here and contact us to learn how Exponential can work with you to ensure your campaigns are running in safe environments.